If you’re thinking about the conferences and events you want to attend in 2015, you might also consider downloading some essential apps to your smartphone to boost your networking experience. There are several apps available to choose from; below are a list of some of the most popular and one-of-a-kind. By now you are likely among the 300 million current LinkedIn members. LinkedIn is notably the largest professional online network, with a host of mobile applications to choose. Why download the LinkedIn app? In any networking situation, LinkedIn’s database of profiles can be an asset, especially if you need to do some background research before making that primary introduction. The LinkedIn app specifically allows you to search for contacts quickly from your smartphone before engaging. It’s also a great way to see the mutual professional contacts you and the person whom you’re meeting have in common. After all, any information can be helpful to aid in conversation-starters. Once the connection is made in-person, locate that contact on LinkedIn, and then carry the conversation online. 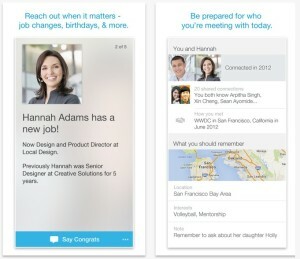 LinkedIn Connected (Free — iOs only) is a new app by LinkedIn that promises to enhance your LinkedIn experience: it provides updates when your contact has a birthday, a work anniversary or experiences a career change, allowing for more opportunities to continue dialogue after the initial meeting. It also lets you add notes about the person for easy reference when you see them again (although you can add notes via the desktop version of LinkedIn also). Evernote Hello has similarities to LinkedIn Connected, but is a great option for Android users not eligible to use LinkedIn’s new app. Evernote Hello can really come in handy when you’re meeting a lot of new people in a short period of time, such as at a convention. To get started, download the app, create a login and sign into your account. Then you can link your LinkedIn or Facebook profile or manually create one. Now you’re set to network. When you’re ready to exchange contact information with someone, simply launch the app, and enter their contact details. Within the same page, the app will prompt the user to either take a photo of the person or — by referencing the contact’s email — suggest a LinkedIn profile match to link to the entry. The app can also email your contact information to the new contact, including the information and photo from your profile. Evernote Hello then saves the date and time of the new entry, the location, and a record of any notes you add then or during future meetings. So, whether you remember new people by name or face, Evernote Hello will make those recollections easier and more readily accessible. The Twitter app is not new on the market, so if you’re an active user it’s likely that you have already downloaded this app. The question is, are you using it effectively to network? How you brand yourself on Twitter through your bio, shared Tweets and retweets, whom you follow, and how frequently you tweet all impact how well you can use the site to connect with others. Your bio is what users see when deciding whether or not to follow you, so if you’re looking to make new connections, you obviously want to attract people with whom you can do that. In your bio, mention (with “@”) the organization or company with which you are affiliated. That provides credibility and allows the user to find out more about your employer. Include the link to your personal website or LinkedIn page, so that your career information can be quickly accessed. Lastly, engage! If you attend a conference or large event, there’s usually an official hashtag. Stay logged into Twitter with the app, and make sure to participate in the conversation and follow other people at the event. If they follow you back and you’d like to take it a step further, send them a direct message. Set up a meeting, or at the very least exchange contact information, because taking the social interaction from online to in-person solidifies the connection even further. Using the Twitter app also allows you to stay connected to what’s happening on Twitter with instant notifications to your cell phone: if multiple users whom you follow suddenly follow someone else, you get a notification, and maybe that person is someone whom you’d like to follow as well. Basically, with the Twitter app, you’re always tuned into what’s happening. In case you’re not familiar with Meetup, it’s a website where you can find out about interest groups in your area, or start your own group. These circles can focus around various interests: people who like the outdoors, or enjoy film and photography — and you can also encounter groups who are organized around your same career sphere. You can RSVP to events and easily add them to your phone calendar. You can also scroll through group members, view their profiles, follow their links to their social media pages, or send them direct messages while on-the-go. This app is especially useful when attending a Meetup, because you discover who else RSVP’d. You can plan ahead regarding those whom you would benefit most from meeting, since you already have their picture and likely a profile to jump-start your networking strategy. Lastly, if you are unable to network with the individual at the event, you can message them through the app and start a dialogue there. You’ll both share the mutual understanding that as a member of the same Meetup group, you already have at least one common interest. Building strong in-person relationships are still a vital part of networking, according to CityHour, an app aiming to increase your business network by allowing the user to setup face-to-face meetings with professionals who have a shared interest or are simply nearby. CityHour syncs with your LinkedIn profile or your phonebook to locate contacts who are open to scheduling in-person meetings. 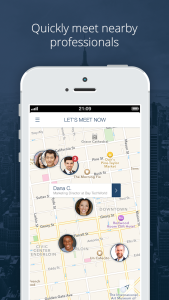 The app maximizes on your location and suggests a mutual meeting place. The user can communication with other users within the app, and all of your meetings sync to your phone’s calendar. With the feature, Let’s Meet Now! Users can connect with anyone within fifty miles who is available to meet within the next two hours. So, if a meeting gets canceled last minute or if you’re traveling for business and you suddenly have some room in your schedule, this app allows you to capitalize on your time with an impromptu networking opportunity. Let’s Lunch is similar to CityHour, but not yet a mobile app and accessible only via their website. It’s worth mentioning on this list however because of its potential in the networking realm. On the site, users can create a profile, and also input their free time and the distance willing to travel. Using information from the user’s profile, the site will determine relevant individuals for you to meet. Two days before the arranged lunch, the user will receive a detailed email with the name of the person they’re lunching with, and a list of suggested restaurants. Both users confirm the meeting and connect in-person. After the meeting, Let’s Lunch encourages you to provide feedback on your lunch companion, to impact their reputation within the site. If a user’s reputation increases, they will be matched with other great users. The more you lunch well, the more your network grows. It is currently only operational in San Francisco, Silicon Valley and New York. However, users can sign up from anywhere. So, if you’re taking a business trip to one of those locations and would like to make the most out of your time, you might want to give Let’s Lunch a try.